After the caterpillar party yesterday on my dill, I thought I should check out my basil. Although the sprig in the photo is a good one, the bugs had nibbled a few holes in the basil, too. Time to use it up. 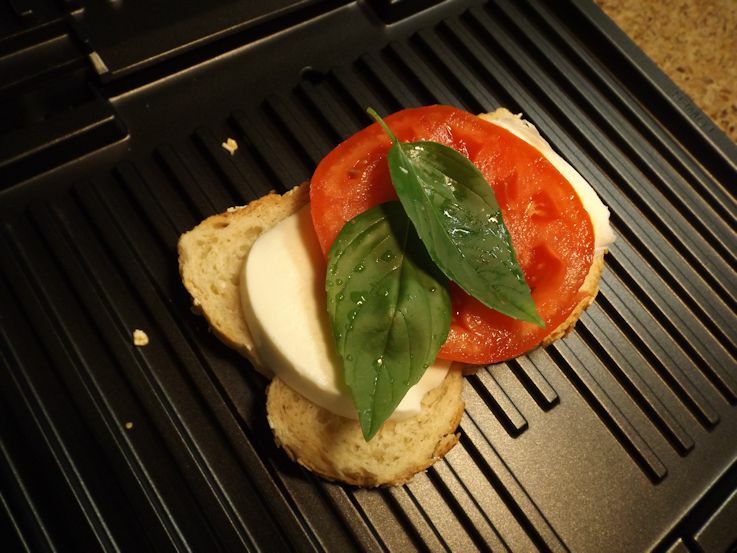 I decided to make some Caprese Paninis. I thought I had cleverly come up with that concept but a quick look on the internet told me a few adventurous souls had beaten me to it. I didn’t copy their recipes so this is somewhat my own invention. 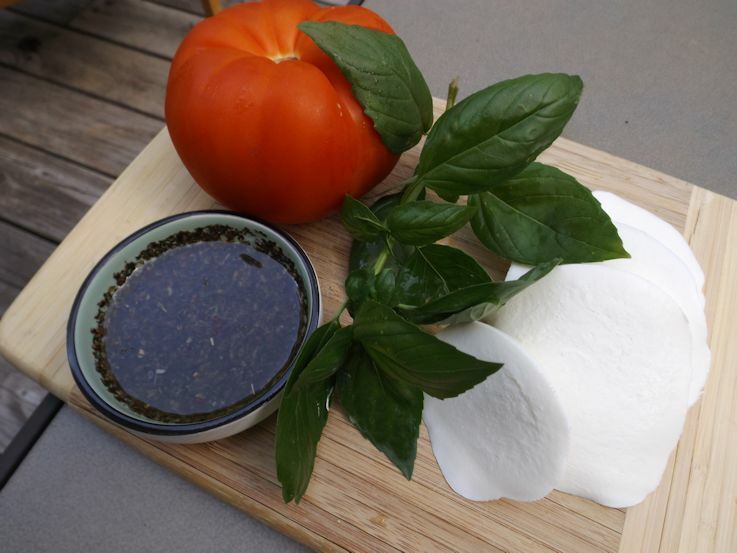 I still have some wonderful tomatoes left from Gregg Farms and of course, the basil. I stopped by the grocery store after work and bought some fresh mozzarella. To me, at $7.99 it was a little pricey so I’m going to try freezing the leftovers in slices so I can make these sandwiches whenever I want to because I will never finish the log of cheese before it spoils. I first made a flavored oil for the outside of the bread. I mixed equal parts olive oil and balsamic vinegar (today it was a tablespoon of each) and then added dried basil and dried dill. It was probably about 1/4 or 1/2 teaspoon of each. I just dumped but my tastebuds would say it was between those amounts. 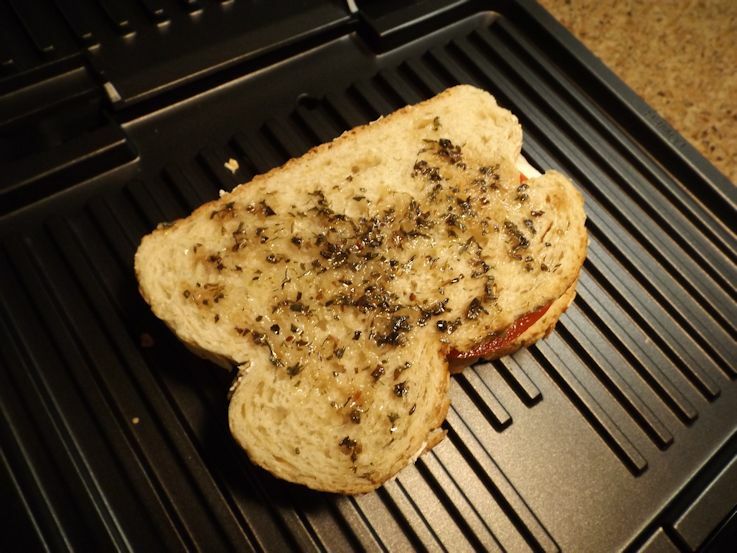 I spread the oil on one slice of bread and placed it oil side down on the panini press. I layered on the tomato, basil, and cheese. Then, I topped it with another slice of bread. You could also drizzle some inside the sandwich. 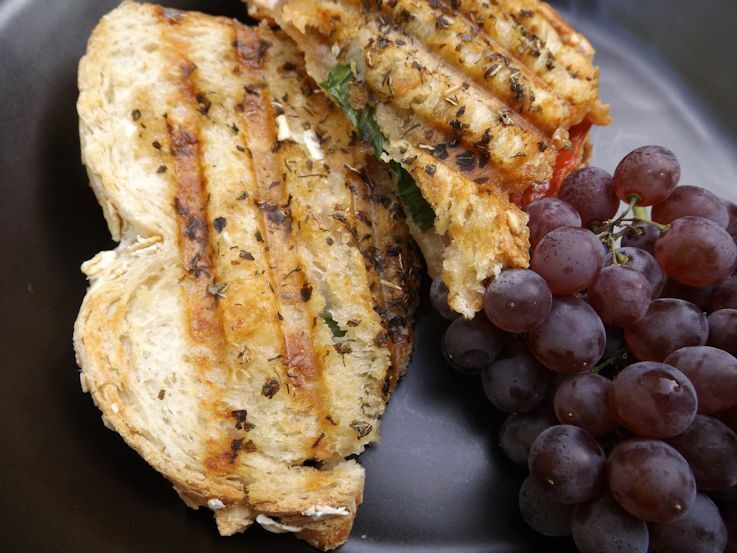 This was a very flavorful sandwich that hit the spot tonight – with or without the bug holes. Got all the ingredients…plan to give your recipe a try….sounds good. Looks yummy! Easy weeknight meal! !